The Honeywell DR90 Dehumidifier has a water extraction capacity nearly 40% greater than the DR65 and will dehumidify a larger home with ease. While a ducted installation is the most effective for whole house dehumidification it too can be utilized as a free standing unit for use in larger crawlspaces, basements or attics provided that a suitable condensate drain is available. The Honeywell DR90 Dehumidifier is Energy Star certified and one of the most energy efficient dehumidifiers in its class. The energy factor of this dehumidifier is 2.5 litres of water per kilowatt hour making it around a third more efficient than other appliances of its capacity. If multiple room dehumidifiers were used to achieve humidity control throughout an entire house the difference in energy use would be even more dramatic. 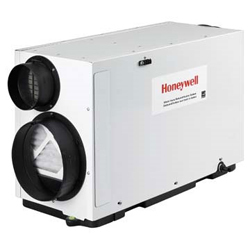 As with the complete range of Honeywell whole house dehumidifiers this unit is designed to be compact to make it suitable for installation in cramped areas, such as a crawl space. Its external dimensions are only 15.75 x 20.88 x 34.5 inches which is remarkable for a unit of its water extraction capacity. The Honeywell DR90 Dehumidifier controls humidity throughout an entire home by working through the ducting of an existing heating/ventilation/air-conditioning system. It is, however, also suitable for free-standing operation in a problem area, such as a basement, crawlspace or attic. The DR90 Dehumidifier is particularly suited to function well in these cooler areas of the home because it is designed for low temperature operation. The performance of many room dehumidifiers is seriously degraded by cooler temperatures while this appliance is in its element. This feature not only makes it suitable for stand-alone operation in such spaces but also means it can fulfil its whole house functions with equal effectiveness while out of sight and sound in the basement or crawl space. Control of the dehumidifying function is achieved by an adjustable humidistat. This device operates in a similar fashion to a thermostat but reacts to changes in relative humidity rather than heat. Once programmed to any given level it controls the dehumidifier which cycles on and off to maintain the pre-set relative humidity. In addition to saving energy this ensures a comfortable environment for the occupants of the house and preserves the fabric of the interior and the contents against moisture damage, mold and unwelcome visitors, especially dust mites. A relative humidity of around 45 to 50% will be sufficient to achieve all these benefits. Stable levels of relative humidity can also be beneficial to certain items kept in some homes, especially pianos. Another benefit of the Honeywell DR90 Dehumidifier is its continuous drainage feature which takes away the need for emptying a bucket to dispose of the water collected from the air. This unit drains continuously into a nearby drain, by means of a plastic hose, taking the condensate away without the user's intervention. In addition to controlling humidity the DR90 also filters the air through its MERV 11 air filter. This will capture a large proportion of the particles from the air, including a large number of mold spores. The unit can also aid ventilation of the home and this feature may be enhanced by taking up the option to purchase additional controls. The Honeywell DR90 Dehumidifier is, unsurprisingly, considerably more expensive than a room dehumidifier. Off-setting this are its far greater energy efficiency, the expectation of a longer service life and the probability that more than one room dehumidifier would be required to achieve similar benefits. This unit alone will be able to control humidity throughout an entire home of up to 2800 sq ft.